The management of USTA Southern is vested in its Board of Directors. 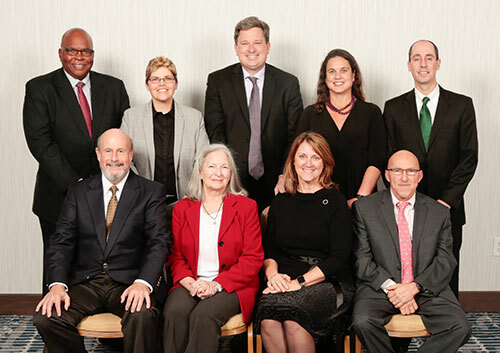 The Board of Directors is composed of 11 members: the President, the Executive Vice President, three Vice Presidents, a Secretary, a Treasurer, a Section Delegate to the USTA and three Directors at Large. All members of the Board of Directors must live within the geographical boundaries of USTA Southern and shall be active members of USTA. 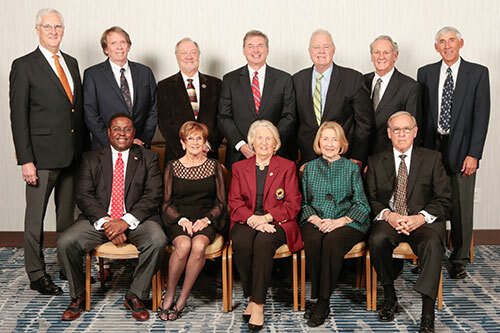 Past USTA Southern Presidents and Presidential Appointees. Front row, from left: Bruce Kingsdorf, LA; Dinah Howard, AL; Donna Mast, NC; Eric Voges, TN. Back row, from left: Ernie James, SC; Rainey Johns, KY; Brad Phelps, AR; Ashley Massengale, GA; Jeffrey Farris, MS.
Randy Stephens, Steve Duffel, Mike McNulty, Rex Maynard, Jack Mills, Jeff Gray. Charlie B. Morris, Jr.; Don Varga.